* Ride the sound Waves of your prayer…. * Be held in a sonic alchemy that whispers deeply to the cells in your body. * Step beyond the Veil of your mind into greater knowing. Allow music to take you closer to your soul truth and your deepest longings and desire. Clear hurts…Heal old stories… Pave the way for magic to unfold. Program your cells into openness and wonder. SoundPrayer uses the healing power of many live instruments, mesmerising voice, affirmation and breath therapy to deeply transform your energetic field into living your purpose and power. With the support of silence, sound, touch, breath and the spoken word we travel through luminal states of cellular awakening. You are guided and supoorted each step of the way. Through experiences not knowledge, we change. And this begins on a cellular level. SoundPrayer uses the healing power of our own deep soul wish. Soundprayer encourages you to be held in a sonic alchemy that whispers deeply to your cellular body, wrapping you in frequencies that caress you into greater knowing and blissful actualisation. As we enter this space we move into ceremony and you are supported by touch, smell and sound in a full body, sensory immersion. Whilst receiving the nourishment of soulful sounds in a safe space this allows a reverberation of cellular memory, reprogramming your frequency to receive greater levels of manifestation and embodied empowerment. The healing strength of ceremony forged with your unique intension facilitates you in releasing what no longer serves you, and frees you to returns to a stream of abundance that is your unique divine birthright. In the round sacred temple space of a Mongolian yurt you are welcomed into your own body temple. With prior consultation, vibrational oils and natural essences may also be used. Each session is unique and different. Perfectly tailored to your needs, we begin our session with nurturing an intension. Space will be given here to connect in with your truth and your story. Using vibrational oils and remedies we fine tune your purpose. Then you will lie in comfort in the temple space, nestled with cushions and cloth as you prepare to receive. You will be given an opportunity to write, share and integrate your experience after the session. Be nourished with gentle touch, high frequency sound medicine and vibrational therapy. You can expect to be deeply held and supported with all you journey with, in highly effective healing. This is valuable space as you heal old stories and pave the way for magic in your life. This investment in you, reprograms your cells into openness and wonder with greater capacity to receive on all levels physically, emotionally, financially and spiritually. You will notice the flow-on-effect into all areas of your life. What are the stages of Soundprayer? Nourish. Illuminate. Release. Fortify. Reprogram. Radiate. 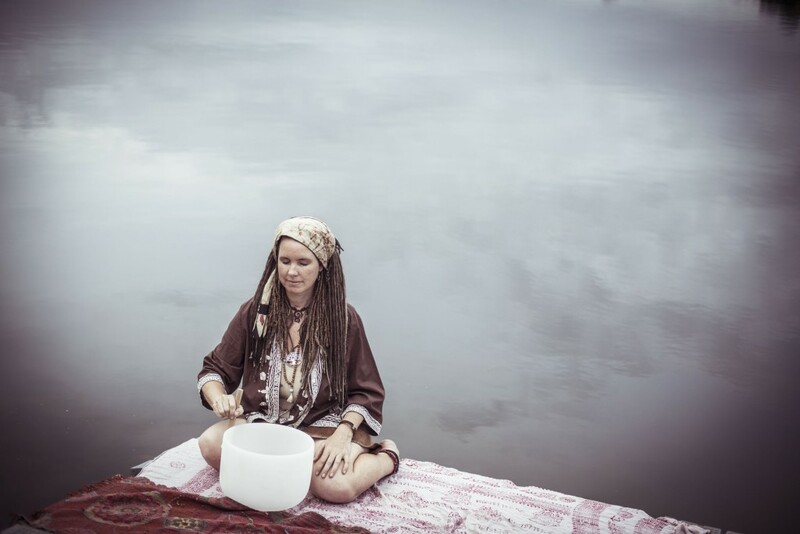 Soundprayer supports deep personal empowerment and growth through earth rhythms, crystalline frequencies, song, percussion, the spoken word and ancient sound. What are my Soundprayer therapist qualifications and experience? Zoe is a Transpersonal counseller, Art Therapist, Meditation teacher and professional Breath worker, experienced in holding retreats using sound and sacred journey work. Zoe’s experience in Transpersonal therapy, vibrational medicine and embodied experience offer a foundation of safety and expertise to all in her presence. Her body wisdom as an Acupuncturist and body therapist as well as her advanced training in breath, ceremony and the healing arts offer a depth critical in this work. You are held in a sensitive, accepting, safe, loving professional space for you to thrive in. What are the ongoing benefits of Soundprayer? Our vibration and frequency affect our whole wellbeing and sense of self. Our filters to the world, plus the spectrum of activity and reactivity adjust through the lens of our vibrational field. And our vibrational field stores our emotions, thought forms, our desires and current and future manifestations. Our unique vibration is the interplay between our soul, mind and body and the frequency we project governs the experiences we receive and create. As you lie in comfort… in the nest of the golden womb temple yurt… surrounded by your own personal prayer, your intentions are magnified and your manifestations amplified. Using safe, embodied shamanic breathwork we open ourselves to the healing available as we release our prayer. This is a unique opportunity to lift your vibration, align to your souls purpose, and clear any blocks in the way of your soul path. You are wrapped in verbal and sonic affirmation as you gently birth the new chapter of your life. And as your frequency changes, things will begin to present differently in your life. Zoe is a professional breathworker trained also in the shamanic arts and meditation. Zoe’s many years of working and supporting others through sacred transformation work in mind and body, leaves you in divinely capable hands. Sound prayer was born through a purpose to deeply assist others in transitioning into the lives they love. Come as you are, and this deep healing space will support you.